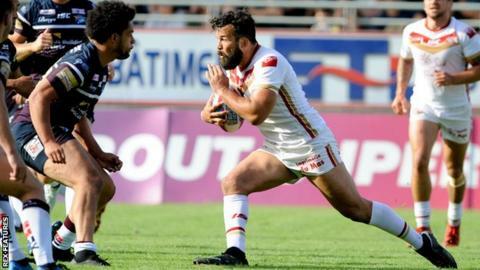 Catalans Dragons' former New Zealand international Louis Anderson is to retire at the end of the season. Back-row forward Anderson, 33, joined Dragons from Warrington Wolves in 2012 and has scored 34 tries in 134 games. He missed out on the Perpignan club's historic first-ever Challenge Cup final triumph last month, against his former club Warrington, with a calf injury. Anderson said: "I am so grateful to have worn this jersey for the last seven years! What an amazing journey." Despite missing Catalans' Wembley triumph, he did collect two winners' medals with Warrington in 2009 and 2010. Steve McNamara, the French club's head coach, added: "Louis has been a fantastic servant not only for the Catalans Dragons but also the whole of rugby league. "He is highly respected by everyone within the game. His decision to retire after a glittering career will leave a big void to fill within our team." Catalans are currently eighth in Super League and need to win most of their remaining Super 8s games to have a chance of climbing into the top four to reach the semi-finals.